J&J traveled over from Miami, Florida to have their dream elopement wedding at Prague’s historic and stunning Vrtba Garden. It is without a doubt one of those architectural gems that lends itself to wonderful wedding photography and in fact it is one of my favorite wedding & portrait locations in Prague. As J&J explained, their first and foremost goal when coming here was finding the right photographer as they envisioned having a day of wedding portraits after their short ceremony. After all it is not every day a young couple are able to travel to Prague and have a very intimate portrait session captured in this incredible city. They told me that they really wanted a mixture of styles: magazine styled portraiture (to ensure everything is picture perfect so the lighting & hair & makeup team was brought out), natural reportage styled images captured of the two during their day (not too many staged images) and of course a killer / stylish & romantic night time portrait session that would be the envy of their family & friends back home. 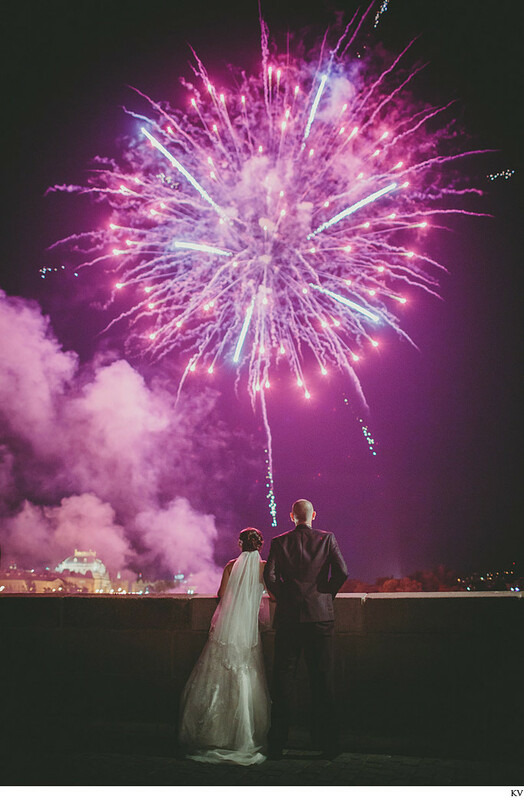 Additionally, the bride-to-be had a surprise for her beau: a fireworks show that was to take place near the Charles Bridge. Our bride also wanted to have a ‘first look’ captured of the two of them at their hotel, the Boscolo Prague Luxury Hotel – a former bank building where no expense was spared on its architectural and interior details. On the day of, I was able to capture the lovely bride to be for a few minutes before heading downstairs where J was waiting patiently at the bar. Though we created some very stylish portraits there, I felt that the best ‘man cave in Prague’ aka the Cigar Bar with its red leather couches, dark wooden and an interior would be perfect for our very stylish groom. We were not disappointed- it is without a very manly place for portraits. A few minutes later, the lovely and beaming bride made her grand entry under the painted ceiling and J was quite clearly smitten with his lovely bride-to-be and before we knew it – we were off to the Vrtbovska Zahrada for their destination wedding. Though it did rain during their portrait session, we were rewarded with a beautiful rainbow and a stunning evening complete with a beautiful fireworks display for our newlyweds. In short, it was a very pleasant, fun filled day with two wonderful people who held their dream wedding & portrait session here in Prague. As a photographer it is sessions like this that make this ‘job’ all the worthwhile. As a photographer I always feel that it is best to let the images speak for themselves as after all they should tell the story and not my personal reflections. The following collection of images is a small sampling of their favorites from their wedding day here in Prague.